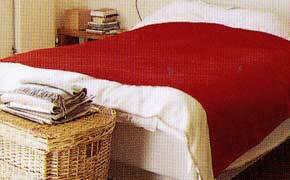 Storage is the most important element in a bedroom after the bed. Here’re some bedroom storage ideas to put essentials and objects where they can be easily reached and yet make best use of available space. The trick is to match the storage to the objects. Storage facilities ideally need to be adapted to each individual, which means that ready-made systems or pieces of furniture are often not the best solution, because they are likely to address a general storage problem rather than your own. Long coats and dresses require a considerable amount of full-length hanging space, usually calculated at a maximum height of 5ft 3in (1.6 m). T-shirt, jeans, sweaters, shirt, hats and handbags need either many shallow shelves or drawers measuring 1ft by 1ft 10in. 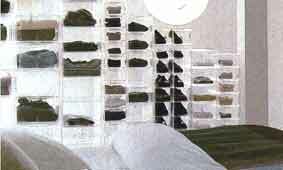 Deep shelves tend to result in piles that fall over. Wardrobe depths should be at least 2 ft (60 cm) to hold a full-sized coat hanger complete with clothes handing on it. Wardrobes heights up till ceiling are recommended though you think you won’t need the space. It’s guaranteed that these will soon be filled with bulky, awkward things. 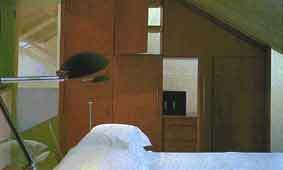 In the bedroom below, the owner built a wall of walnut-veneered doors to hide away everything that might need storage. Hanging space is often best divided into 2: one above and another below. The associated access problems of an upper hanging space have been resolved with the introduction of wardrobe lifts; weighed hanging rails that pull down by means of a central rod. Free-standing wardrobes can be challenging to integrate. This is because they take up a large amount of space and are rarely designed to work with your particular clothing problems. The obvious alternative is a fitted wardrobe, or a combination of cupboards and wardrobe. 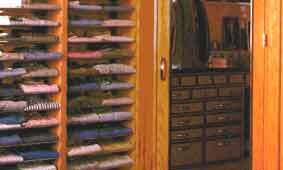 You may break the wall of doors up with color, architectural details and carefully chosen knobs. The example below shows fitted cupboards with staggered units of varying depths. The doors are furnished with large and striking handles. Another alternative is to have a mix of shelves and cupboards covering an entire wall (see below left). The design looks neat and streamlined with the doors are closed and yet suits the storage of virtually every possible type of clothing and object. Note also the wall of drawers hidden behind wardrobe doors for the picture below right. If you incorporate drawers or shelves into built-in units, make them plentiful, shallow and consider fronting them with plastic, glass or cut-out section for easy recognition. Remember to allow room for garments that are not used every day, such as sports equipment and skiing clothes. You may also want to have open shelves as shown below. For the bedroom shown below right, the shelves are in translucent acrylic with an almost conceptual display of clothing, staggered along one side of a bedroom. The regularity and order of such a display is visually stimulating, but also requires a highly methodical approach. Custom wardrobe is also suitable for small bedrooms. One of the many small bedroom decor tips is to use a wall of fitted storage to make the room look larger and properly planned. This in turn will reduce the need for other furniture. Also, bear in mind that it is no good storing something that you cannot easily access when you need it. Although it might make sense to put, say, seasonal clothes away in high cupboards when the season changes, it makes very little sense to use those same high cupboards for things you use regularly. Although shelves, hanging rails and drawers are the most conventional forms of storage, there are other bedroom storage ideas, including boxes, baskets, free-standing rails, and even bags. As with any other furniture, storage should be chosen to complement the style of the room. And storage solutions do not necessarily have to be expensive – shelves divided into different section, for example, can provide a good basic system, as can different heights of hanging rail, perhaps screened from view by a curtain or blind. 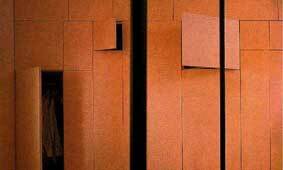 The first example shows Japanese-style shoji panels which are a less rigid solution to conventional doors. 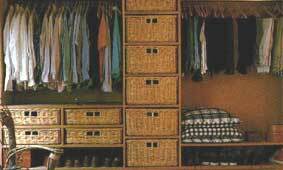 In the picture below, a storage system has been constructed using wicker baskets of different dimensions as drawers. 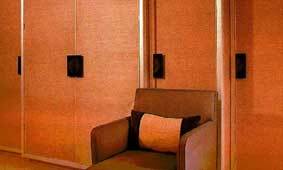 Hanging space is incorporated into the system which has been carefully planned. Return to the top of bedroom storage ideas.